NIDA researchers have found that, when it comes to brain cells, "speed" actually does kill. "Speed" is a street name for methamphetamine, a powerfully addictive stimulant. Previous research had shown that methamphetamine damages but does not kill certain nerve cells in brain structures that control movement. The new research, conducted in mice, indicates that methamphetamine-induced damage prompts other nerve cells in brain regions involved in cognition as well as movement to self-destruct. The new findings raise concerns that methamphetamine may have significantly more harmful long-term consequences than previously thought, the researchers say. 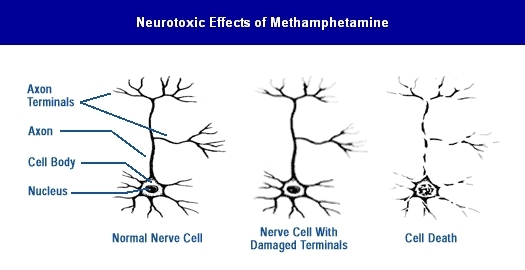 Previous research showed that methamphetamine damages the nerve terminals of dopamine-producing brain cells. The new research shows methamphetamine also triggers a natural mechanism called apoptosis that prompts the complete disintegration and death of additional nerve cells in other brain regions. Previous research showed that methamphetamine damages the nerve endings of brain cells containing dopamine, a chemical messenger that plays a role in movement and pleasure. Animal studies indicate that a gradual, partial recovery occurs in the dopamine system when methamphetamine exposure is stopped. For example, a recent imaging and postmortem study of the brains of monkeys found substantial recovery in dopamine function over an 18-month period following the animals’ last exposure to the drug. However, human brain imaging studies suggest that significant damage to nerve endings of dopamine-containing cells persists in the brains of chronic methamphetamine abusers for at least 3 years after they have stopped using the drug. The damage, which affects dopamine nerve endings located in the brain structures that make up the striatum, is similar to but less extensive than that caused by Parkinson’s disease. "People used to think that the most serious methamphetamine-induced damage was to dopamine nerve terminals because it put people at risk for developing Parkinson’s disease as they got older," says Dr. Jean Lud Cadet, clinical director of NIDA’s Intramural Research Program (IRP).’ve now shown in our lab that methamphetamine is much more toxic than previously thought. It does not just destroy the endings of dopamine-containing nerve cells, it also kills other nerve cells that produce other neurotransmitters in additional brain pathways," he says. IRP researchers led by Dr. Cadet first linked this widespread loss of brain cells to a natural mechanism called apoptosis, through which the body programs unhealthy cells to kill themselves. In a study in cell cultures, they showed that treating rat brain cells with methamphetamine caused cell death marked by apoptotic patterns, such as DNA fragmentation and disintegration of cell bodies. Subsequent studies in genetically engineered mice that lacked specific genes known to promote or suppress programmed cell death suggested that at least part of the nerve damage caused by methamphetamine may result from activation of the molecular machinery that is involved in apoptosis. 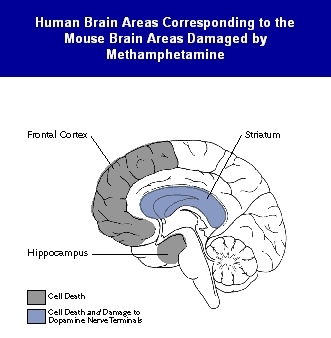 The strongest evidence that methamphetamine unleashes widespread apoptosis in animals came in a recent study that showed the drug caused DNA fragmentation and loss of nerve cell bodies in the striatum, the hippocampus, and the frontal cortex of mice brains. "Although these findings are in mice, if methamphetamine kills nerve cells in the same brain regions of humans who abuse the drug, the functional consequences could be significant," Dr. Cadet says. Loss of cells in the hippocampus and cortex could damage memory, cognitive function, and decision-making capacity, he says. Loss of striatal cells could lead to serious movement disorders that resemble tardive dyskinesia and Huntington’s chorea. Recent brain imaging studies in former methamphetamine abusers conducted by Dr. Richard Ernst and Dr. Linda Chang at the Harbor-UCLA Medical Center in Torrance, California, provide additional support for the finding that methamphetamine abuse causes brain cell death, says Dr. Cadet. The California researchers found alterations in brain chemistry in long-term methamphetamine abusers indicative of nerve cell loss or damage similar to that found in people suffering from strokes or Alzheimer’s disease (see "Brain Imaging Studies Show Long-Term Damage From Methamphetamine Abuse"). If methamphetamine kills brain cells in humans, it may cause cognitive impairments that will have to be addressed when treating methamphetamine abusers, Dr. Cadet says. Although impaired people can do well in treatment, it is possible that developing medications to repair the brain could help such patients to do even better, he says (See "NIDA Pursues Many Approaches to Reversing Methamphetamine’s Neurotoxic Effects"). Cadet, J.L. ; Ordonez, S.V. ; and Ordonez, J.V. Methamphetamine induces apoptosis in immortalized neural cells: Protection by the proto-oncogene, bcl-2. Synapse 25:176-184, 1997. Deng, X; Ladenheim, B.; Tsao, L.I. ; and Cadet, J.L. Null mutation of c-fos exacerbation of methamphetamine-induced neurotoxicity. Journal of Neuroscience 19(22):10107-10115, 1999. Melega, W.P. Recovery from methamphetamine induced long-term nigrostriatal dopaminergic deficits without s ubstantia nigra cell loss, Brain Research, in press. McCann, U.D. ; Wong, D.F. ; Yokoi, F.; Villemagne, V.; Dannals, R.F. ; and Ricaurte, G.A. Reduced striatal dopamine transporter density in abstinent methamphetamine and methcathinone users: Evidence from positron emission tomography studies with [11C]WIN-35,428. Journal of Neuroscience 18(20):8417-8422, 1998.